Lovers, in the left corner cast your glamorous gaze upon Casadei’s pretty Platform Sandals in Coral from the Spring/Summer 2011 Collection; to the right, prepare to be swept away by Jessica Simpson’s charming Prinnce in Cranberry Maya Nubuck. While the platform and heel height of the jewel-toned Jessica Simpson lovelies is a bit higher than that of their couture cousins; for a mere $98.00, as opposed to the $675.00 price tag of the Casadei Platforms, they are the perfect footwear selection for the frugalista looking for her knight in shining armor – and affordable enough to scoop up three saucy shades (Cranberry Maya Nubuck, Whiskey Lima Leather, and Black Eco Nappa)! Thanks to TheCorner and Jessica Simpson Collection for the pictures. I love the color of J.S. 's shoes. jessica simpson! the platform looks way better! I like the color of the Jessica Simpson ones more. So love the Jessica Simpson rivals. awesome shoes! so glad Jessica is making her version. Really love the colors. But I think I'd wear the cranberry best. 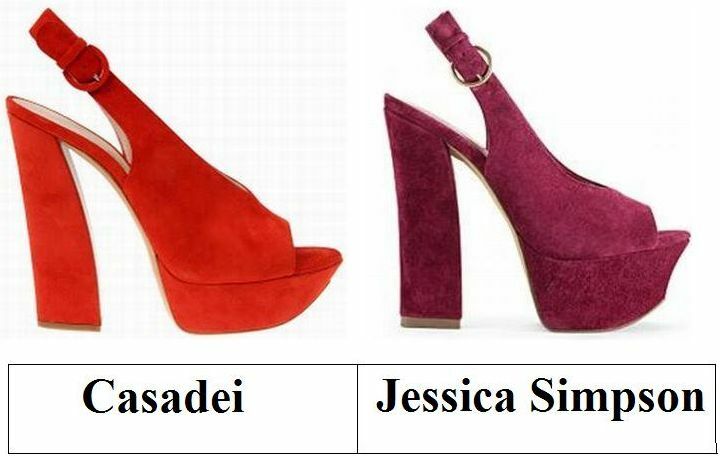 The J.S version is perfect for me, more so than the Casadei version. well, sometimes it's best to look for items that have a comparison to the real thing ! Both are cute; I like the Jessica Simpson shoe color better though. Oh, these are just so cool! i really love these both! wonderful colors. I love the bold colors of both! Jessica Simpson all the way! I love the colour of the Jessica Simpson ones but I just don't think I could walk in them. I love the red color, but the Jessica Simpson ones are an exact copy! I'm not sure I could handle the height of either! Gorgeous color on the Jessica Simpson ones, though. And both are of such yummy colors! Love them! both beautiful but at the price difference I am taking the Jessica Simpson .... her shoes keep getting better and better. Love the color of them both...I think I love the Coral a little bit more! Great looking shoes though! Great find dear.. Jessica Simpson's looks awesome and come with a wallet friendly price tag too! I love the Jessica Simpson pair!